Product Details-Material ? stainless steel blades , suitable - small dogs, cats, small pets and birds. Product Information-Trixie Dog-Cat Nail Clipper Regular claw-trimming is an important part of good pet care and makes life more pleasant for both you and your pet. Before you start to trim make sure you have a firm grip on your pets paw. Then gently push the claws out. Only trim the tip of the clear outer section of a light coloured claw. 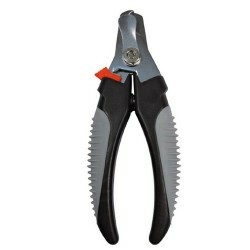 If your pet has dark claws you should consult a vet.The claw scissors have a non-slip grip for maximum control when trimming. The blades are made from stainless steel blades and will not corrode.